I've not posted, or quilted much. My sister and hubby, two of their sons and families live in the totally flooded town of High River, Alberta, population 13,000. After a long wait (dangers under all that water), they were allowed into the mess yesterday. She just told me that today is her "day to cry" as she realizes the extent of their losses and struggles putting precious parts of their life into trash bins. My heart aches for her and so many others. We've been told that even the newscasts have not shown the worst of it. The flood waters are still being pumped out of the northeast part of the city that had homes totally covered. Most do not have any utilities. Some businesses are trying to reopen. It is a smelly dirty mess with raw sewage in the water. Cars, boats, other things like sinkholes add to the cleanup and some are perils. A large portion of the homes need to be gutted, some bulldozed. A few escaped the flood but humidity has taken a toll. 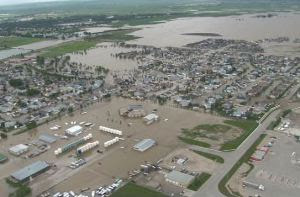 If you pray, please remember the population of High River, and if that is too big to think about, pray for Janet and Lyle. Will do . . . what challenges they face. Our prayers are with all of those suffering through this disaster! It's so hard to lose those things that mean so much and can't be replaced.